Research shows that many clients seeking therapeutic help attendfor one session only--no matter what their therapist's orientationor approach. Moshe Talmon demonstrates how therapists can turn thissingle encounter into a positive therapeutic experience. Based on a study of hundreds of single-session cases, this bookoffers a realistic, practical approach to using a single session toprompt substantial changes in patients' lives. The author describeshow to make the most of patients' innate ability to healthemselves--presenting insights into bolstering the patient'sexisting strengths, restoring autonomy and confidence, and offeringsolutions that the patient can implement immediately. Moshe Talmon was born in Kibbutz Beit Alpha in 1950. He is one of the founders of a psychotherapy method known as Single-Session Therapy. 1. When the First Session Is the Only Session. 2. The First Phone Call: Presession Screening andPreparation. 3. 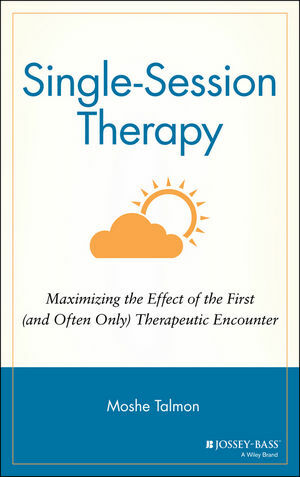 Effective Single-Session Therapy: Step-by-Step Guidelines(incollaboration with Michael F. Hoyt and Robert Rosenbaum). 5. Single-Session Therapy in Action: A Case Example(incollaboration with Michael F. Hoyt). 7. Attitudes That Facilitate Single-Session Therapy. Resources B: Tips for Managing Time and Money.